Main St Murals is a Non Profit Community Arts Organization working with professional artists to develop a gallery of historic murals along Route 66, Barstow. The organization is based at the Desert Discovery Center where they also host a series of Art and Environmental Education programs serving schools from across the high desert and visitors from around the world. This unique exhibition showcases the collaborative sculpture of local youth with professional artists. The joyous design and broad brushstrokes of both sculpture and photography celebrate the heritage of the Mojave Desert and the positive force of Environmental Art in Education. 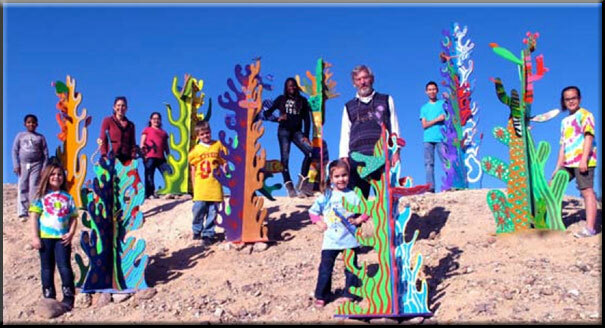 The “Crazy Cactus” Art Project was initially developed as part of the Main St Murals 2011 after school youth program “Discovering the Mojave Desert” located at the Desert Discovery Center, a facility for Environmental Education in Barstow, California. The project was devised by David Brockhurst, a Production Designer and Artist as an initial means to recycle cast off pieces of wood used for an Earth Day mural project. The aim was to auction these pieces of recycled, environmentally conscious art to raise funds for the popular after school program that explores Science, History and Art, hosted by Main St Murals. The Crazy Cactus project captured the hearts and minds of the students, who took great delight in painting freely using the natural environment as their inspiration. The local community also got involved during weekend art workshops where families were encouraged to take part in Crazy Cactus art activities. We hope you enjoy the creativity and vitality of the Crazy Cactus exhibition and we encourage families, businesses and art lovers to make a pledge for your own unique crazy cactus art sculpture. In turn you will be supporting environmental and art education at the Desert Discovery Center and celebrating the Mojave Desert and its unique wildlife. Be an Environmental Art Steward and Pledge Today! Funds raised through the Crazy Cactus project will be used to support the after school youth program which is in its 6th year and continues to offer FREE environmental education at the Desert Discovery Center in Barstow. www.mainstreetmurals.com and www.desertdiscoverycenter.com Like us on facebook, or better still come by and visit the center which is located just off the I15 at the Barstow Rd turn off – 831 Barstow Road, Barstow CA 92311. The Desert Discovery Center is due to re-open March 12th following an exciting renovation. Desert Discovery Center Partnership: Bureau of Land Management, National Parks Service, San Bernardino County, Southern California Edison, Barstow Unified School District, Barstow Community College, High Desert and Mountain JPA, National Parks Conservation Association, Mojave River Valley Museum, Off Limits Design, St Pauls Academy and Main St Murals.